If you’re anything like the rest of us, you’re pretty bummed that the last home game of the season just passed us. Hopefully, though, unlike me, you were there and got to witness the epic battles for the bragging rights of the Grudge Match and the trophy of the Championship match. However, if you weren’t, Slams McKenzie has a treat for both of us in the recaps of both games! PLUS! If that’s not enough to wet your whistle in satisfaction until next year, keep an eye out on the blog next week to see where you can get your next big ARG derby fix! 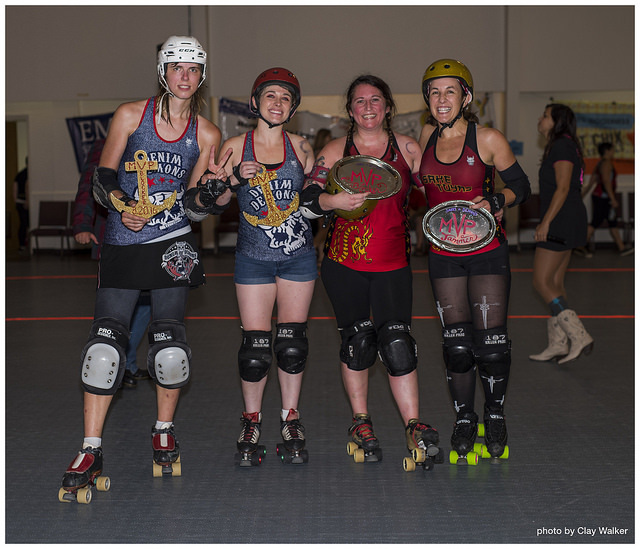 Last Saturday, the Denim Demons and Sake Tuyas competed in this year’s Grudge Match for 3rd and 4th place in the Atlanta Rollergirls’ Home Team Championships. Earlier this year the Demons took a 29 point win over the Sakes in the season opener, but the Sakes went on to defeat the Apocalypstix, a team the Demons later lost to by a wide margin. There was no clear favorite, as both teams had gone 1 – 3 so far this season. The game started with a 4-4 tying run, followed by a few power jams in the Demons’ favor, resulting in the Demons’ lead by a narrow margin. The Sakes continued to fight, matching the Demons’ score, only trailing by a single point near the end of the first half. The Sakes finally took the lead in the first jam of the second half, but the Demons kept close, never allowing the score to drift more than 10 points apart. Fifteen minutes into the second half however, the Sakes began to pick up steam and pulled 35 points ahead. The Demons fought to close the gap, but there wasn’t enough time to take back the lead. The Sake Tuyas took 3rd place for this year’s home season with a win of 142 – 121 over the Denim Demons. 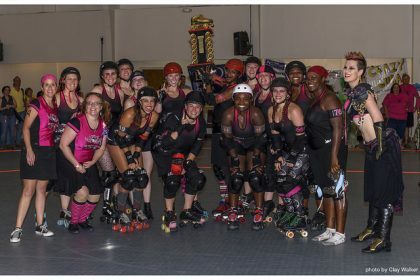 This season’s Championship Game featured last year’s Champs, the Apocalypstix, defending their title against four-time-champ winners, the Toxic Shocks. There were no doubts that the Shocks would enter into the Championship Game as they had an undefeated record so far this season, including a previous win over the Apocalypstix by 33 points in the season’s opener. The reigning champs however had gone 1 – 3 so far, which had resulted in a three-way tie with the Denim Demons and Sake Tuyas. Point spread finals had to be tallied to derive who would take on this season’s undefeated juggernaut, the Toxic Shocks. When the math was done, the Apocalypstix sat firmly in second place with their grasp still on the Home Team Championship Trophy. The game started with a penalty against the Stix jammer, handing the Shocks a 13 point power jam, followed by another quick four point jam, landing the score at 17-0, Shocks. Things were looking grim at the beginning for The Stix, until they took advantage of a power jam in their favor and put up 17 points in two minutes, tying the game. The Stix slowly started to pull ahead, but the Shocks stayed on their heels for the rest of the first half, which ended 87-55, Stix. The Stix began to land huge scoring runs at the beginning of the second half however, spreading the point gap to slightly over 100 points. As the Stix pulled ahead, the physicality of the game intensified. Large hits and pile-ups became frequent toward the end of the game, but the reigning champs maintained control. In the final seconds of the game, and with the win in site, the Apocalypstix made an unconventional move and put retiring skater, fan-favorite, and regular blocker, Slamborghini, in as the team’s final jammer. 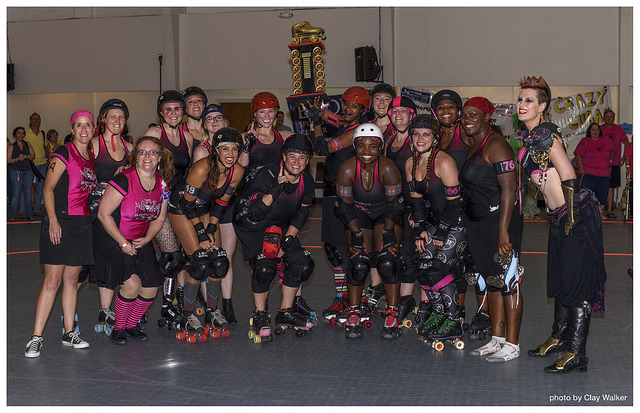 Slamborghini won lead, and in an outstanding display of sportsmanship, the Toxic Shock’s jammer, Afro Dykee, skated hand-in-hand with Slambo around the track before Slambo scored the final points on her team’s second-time-in-history championship victory. The Apocalypstix won the 2016 season’s Championship Game 215-121.